Summary: As an organization devoted to conservation of the sea turtle population particularly of Singer Island, we believe that educating Singer Island’s residents and visitors is essential to our efforts. We propose to create, produce and distribute a tri-fold paper brochure that explains to the public the dangers faced by sea turtles and the steps that we can take to promote their survival. 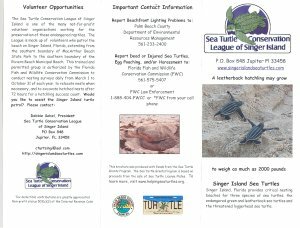 The brochure will also provide resource information regarding volunteer opportunities, opportunities for guided viewing of sea turtle nesting, and contact numbers for reporting, inter alia, harassment or poaching of sea turtles or their eggs, injuries, and beachfront lighting problems. The brochure will be written in language accessible to all ages, and will be distributed through myriad sources: other environmentally-conscious non-profits (such as the Loggerhead Marinelife Center); the nearby state park (John D. MacArthur Beach State Park); area hotels, motels and condominiums along Singer Island; the FFWCC Tequesta Field Station; our organization’s volunteers, when they encounter beachgoers as they their conduct nesting surveys; and through our organization’s informational/fundraising “turtle booths” that we staff periodically during the year. Results: Our brochures were printed in a timely fashion, within budget. The brochures are being stored and are readily available for distribution by volunteers. Brochures were handed out to beachgoers, Jupiter River Center, Tequesta Field Station, City of Riviera Beach, lifeguard stations, and local beach front hotels, resorts and restaurants.